While I happen to be pretty good at and thoroughly enjoy writing Boolean queries for talent mining, I actually love the entire recruiting life cycle. Sourcing is a means to an end, not a means in and of itself for me. Even so – with such a provocative post title (nice work John! ), I had to read the article. Things really got interesting when I got down to the comments on the article, as I stumbled into an interesting exchange between Amybeth Hale and Keith Halperin which covered direct sourcing, referral recruiting, and outsourcing sourcing at $6.25/hour. Read on to learn my thoughts on all of the above. I’m not exactly sure where the whole concept of sourcing vs. recruiting comes from, but I do find it interesting that some people think that people who source spend more time writing Booelan search strings than they do recruiting. I think it comes mostly from people who either don’t know how to source candidates via ATS/CRM systems, resume databases, social media and the Internet, or just aren’t that good at it. For anyone who is remotely adept at sourcing, the actual process of creating and refining Boolean (and Faceted search on LinkedIn) takes less than 10% of their time. For me, that number is less than 5%. On an average recruiting day, I might spend 15 – 20 minutes or so per day working specifically on building and refining Boolean search strings. That’s about 3.1% to 4.2% of an 8 hour day. If someone is spending more time writing Boolean search strings than calling potential candidates, something is seriously wrong. Of course, if you’re dealing with low quality/shallow data (the Internet) and poor search interfaces/capability (many ATS’s and some search aggregators), that time might expand somewhat – but it should never be a significant chunk of any given day. No one should be asked to be fast, efficient and highly productive if they are stuck with using only free sources and a practically unsearchable ATS – but that’s a topic for a future post. Oh, and you did know that there are more recruiters and HR professionals who source candidates than sourcers who source candidates, didn’t you? Just one more reason I am confused by the sourcing vs. recruiting mentality. Ultimately, the whole point of becoming more facile with information retrieval (Boolean search, faceted search, semantic search, talent mining, etc.) is to be able to more quickly identify and engage people to assess their potential as candidates and/or get referrals. There is nothing intrinsically wrong with outsourcing sourcing, but I love to hear of people using resume and lead sourcing services at rates as low as $6.25/hour. When you pay $6.25 – $15/hour for sourcing, you’re essentially getting a resume scraping service, which literally scrapes the surface of the talent pool in the sources being searched. This level of sourcing is what I refer to as Level 1 Talent Mining (with perhaps a sprinkle of Level 2), which essentially finds what everyone else finds with basic and imprecise searches. The proverbial tip of the iceberg, offering no competitive advantage. If anyone can hire all of the people they need to, at the level of candidate quality and at the speed needed using this level of sourcing, then more power to them. One thing to think about, however, is that you may be paying $6.25 per hour and be billed for an hour that was really 5-10 minutes of someone’s time. Some of these folks may be really making $37.50 – $62.50 an hour for their services. I’m going to take this post as an opportunity to clear the air with regard to sourcing (Boolean et al) vs. referrals. When searching internal ATS/CRM systems, job board resume databases (e.g., Monster, Dice, Careerbuilder, Indeed), LinkedIn, the Internet, etc. – the results returned by the searches are merely first-order results, and only represent a fraction of the talent that can ultimately be reached and actualized. Any sourcer/recruiter worth their salt is not only looking to potentially recruit the people directly returned by their searches (first-order results), but also tap into the networks of those people (second-order results, third-order results, etc.). In that sense, any source that can be searched can be viewed similarly to LinkedIn, as each person directly retrieved via any search method or source knows people who know other people, and so on. Here’s the bottom line: Sourcing via Boolean search strings or any other method of information retrieval affords referral recruiting opportunities. In fact, the more effective and efficient you are at sourcing, the faster you can crowdsource your hiring need. 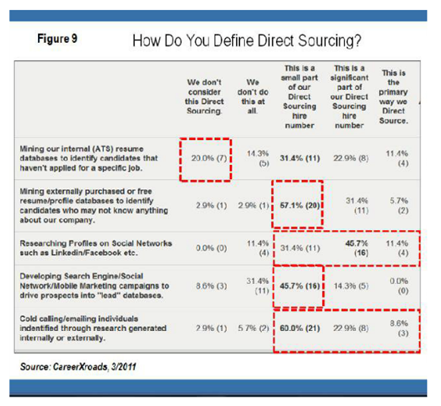 Yes, strong sourcing actually accelerates and multiplies any sourcer’s/recruiter’s referral recruiting opportunities. If you’re searching ANY site/source and your’re not tapping into the second- and third-order+ results available (each person’s direct and extended network), leveraging everyone you contact for networking and referrals, you’re not doing your job as effectively as you could. 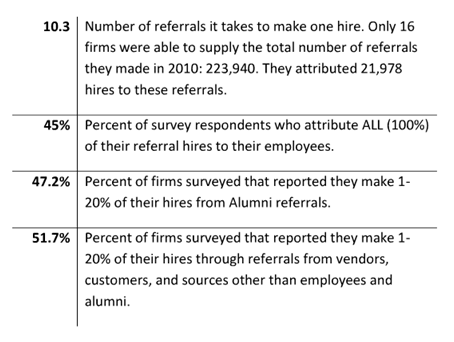 Are Referrals Really the #1 Source of Hire? Gerry Crispin’s CareerXroads fantastic Source of Hire data was mentioned and linked to in the comment exchange between Amybeth and Keith, so I decided to take a peek (again). Notice that 27.5% of hires came from referrals. No surprise there, right? If you keep moving through the report, you’ll find that 45% of the respondents attributed all of their referral hiring from employee referrals. That means a good chunk of referrals come from non-employees. You’ll notice that the #2 source of hire was job boards, at 24.9%, nipping on the heels of referrals (27.5%) as a source of hire. Yeah, I know – I thought job boards had been killed years ago by social media and referrals. Who knew? Humor aside, if you keep moving forward to Figure 15, you can see that 52.8% of firms said that their job board hires were predominantly from postings and not resume searches. 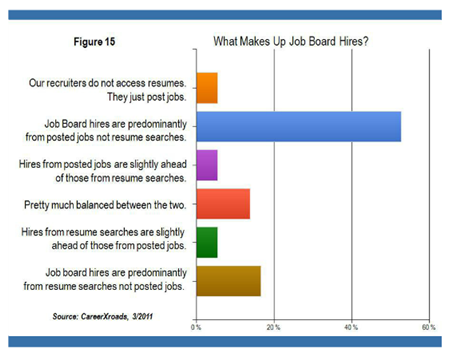 That still leaves a good percentage of job board hires coming from resume searches. So let’s say you search Monster (via Boolean queries) for potential candidates, contact someone who turns out to not be available to consider making a move at this time, you sell your opportunity to them and ask who they could recommend for the role, and they refer you someone. Let’s say that the person referred to you is a great fit and eventually gets the job. What’s the source of the hired candidate? What’s the probability that it’s coded properly in the ATS? Who knows – if every referral hired that came from people sourced through job board, ATS, Internet or social media searches was actually coded properly and specifically, referrals may not actually be the #1 source of hire. What is Direct Sourcing Anyway? 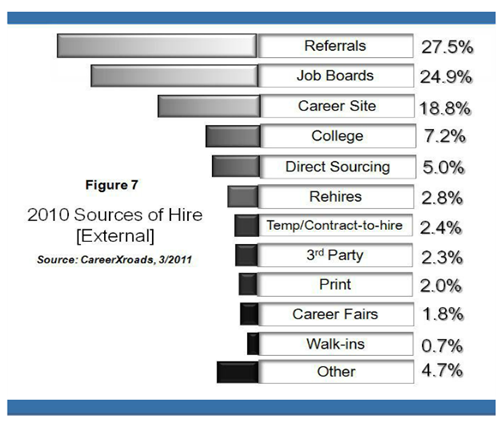 So a solid chunk of the searching (via Boolean queries or otherwise) of internal ATS/CRM systems and job board resume databases to identify and engage potential candidates isn’t really a part of the 5% of direct sourcing, and could in fact be a significant contributor to the “Job Boards” source of hire. Which, I might remind you, is 24.9%. Also, it is interesting that “ATS” isn’t its own source of hire in the survey – could it be lumped into the “Career Site” source? With regard to ATS search (Boolean queries or otherwise), we could easily run into source of hire coding accuracy issues. For example, let’s say you search your ATS for potential candidates and find an old resume from someone who responded to a Monster ad over a year ago. Let’s say you make contact with this person, recruit and hire them. See the source of hire coding challenge? Either way, the hire came from a search. Likely Boolean. I completely understand and appreciate the sell and positioning of products and services that “perform your searches for you” – not everyone wants or needs to know how to leverage information systems for talent identification, nor is everyone capable of doing so effectively. However, as I have written and spoken about many times before, any attempt to automate information retrieval without human influence in the querying process has significant limitations and issues. Of course, it certainly doesn’t help that the people who are drawn most to automated solutions are the least equipped to be able to test the claims made by those who are selling automated search solutions. I hope I’ve made a dent in the sourcing vs. recruiting issue – it’s not an either/or relationship. Sourcing is a critical part of recruiting – you can’t engage, recruit and hire someone you haven’t identified in the first place. Posting jobs only attracts active candidates, and referrals only account for 27.5% of external hires – so if you’re going to try and recruit people who haven’t found your job and can’t be reached through employee referrals, you can find and target passive candidates (and even those who aren’t looking but can be recruited!) by searching ATS/CRM systems, job board resume databases, LinkedIn, Facebook, Twitter, the Internet, etc. Additionally, searching information systems for potential candidates affords you the opportunity to tap into second- and third-order results – the networks and connections of the people you find directly from your searches, increasing and accelerating your referral recruiting opportunities. Not everyone has to be interested in or capable of searching databases, social media and the Internet to source potential candidates, but there is no denying that the volume of and speed at which human capital data is being generated poses a huge opportunity and need. For example, some really smart people have been talking for quite some time about the latent power of data, and more specifically human capital data. Here’s the thing about data – data requires analysis for insights, intelligence, and decision making, but data can’t be analyzed until it’s retrieved. And the simplest form of information retrieval involves Boolean logic, whether it’s in your face or behind the interface. Oh – and one last thing…if you’re spending more time creating and refining Boolean search strings than engaging candidate prospects, I’d advise you to get a mentor and perform some deliberate practice to get better and faster at information retrieval, perhaps invest in some training, or if you have no desire to get better at sourcing – outsource your sourcing to specialists if that’s a viable option.